In a 2006 interview on the radio program Democracy Now, bassist Charlie Haden, who died in 2014, was interviewed by the show’s host, Amy Goodman, about his long relationship with the saxophonist Ornette Coleman. Charlie Haden’s story points up the opposing reactions to Coleman’s music within the jazz world. There were those, like Haden, who found it brilliant. But there were others, like Mulligan, who struggled with it. And that disparity of appreciation has persisted to this day. But make no mistake about it, few musicians in the history of jazz can match Ornette Coleman for the sheer impact of his musical concept. 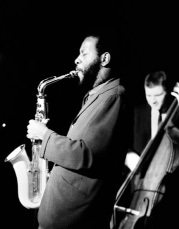 Born Randolph Denard Ornette Coleman, he was a saxophonist, violinist, trumpeter and composer, and one of the major innovators of the free jazz movement of the 1960s. It was Coleman, in fact, who gave free jazz its name, having made it the title of a 1960 album. And now, Ornette Coleman has died in Manahattan on June 11 at the age of 85. Coleman was born in 1930 in Fort Worth, Texas, and raised there. In high school, he participated in band but was kicked out for improvising on “The Washington Post,” a John Philip Sousa march. Soon he began performing R&B and bebop, initially on tenor saxophone, and started a band, the Jam Jivers, with some fellow students including Prince Lasha and Charles Moffett. Seeking a way to work his way out of his home town, he took a job in 1949 with a traveling show out of New Orleans that was run by Silas Green. Next he toured with rhythm and blues shows. After a show in Baton Rouge, Louisiana, he was assaulted and his saxophone was destroyed. He switched then to alto saxophone, which remained his primary instrument, first playing it in New Orleans after the Baton Rouge incident. He then joined the band of Pee Wee Crayton and travelled with it to Los Angeles, where he worked at various jobs, including as an elevator operator, while continuing to pursue his musical career. From the beginning, Coleman's music and playing were in many ways unorthodox. His approach to harmony and chord progression was far less rigid than that of bebop performers; he was increasingly interested in playing what he heard rather than fitting it into predetermined chorus structures and harmonies. His raw, highly vocalized sound and penchant for playing “in the cracks” of the scale led many Los Angeles jazz musicians to regard Coleman’s playing as out-of-tune. He sometimes had difficulty finding like-minded musicians with whom to perform. One of those like-minded musicians with whom he did connect, of course, was the bassist Charlie Haden who, after hearing him that night at The Hague, returned to his own gig with Paul Bley the next night. Talking with Bley’s drummer, Lennie McBrowne, he said, “I heard this guy play, who was brilliant, and played like the human voice.” Lennie asked, “Was he playing a plastic horn?” Haden said, “Yeah.“ McBrowne said, “That was Ornette Coleman. I’ll introduce you to him.” And Lennie brought him in. Having found each other in this way, Haden and Coleman played together not infrequently in Los Angeles. And when Coleman made his East Coast debut at New York’s Five Spot, Haden was in the quartet, along with Don Cherry, trumpet, and Billie Higgins, drums. The East Coast jazz establishment’s reaction to Coleman’s anarchic approach to the music was as divided as it had been on the West Coast. Miles Davis, Red Garland and Coleman Hawkins were initially openly hostile to Coleman. Dizzie Gillespie said “I don't know what he's playing but it's not jazz.” Davis commented, “the man is all screwed up inside.” Drummer Max Roach took his outrage even further, following Coleman backstage one night and punching him in the mouth. Originally booked for a two-week residency at the Five Spot, a gig that was later dubbed “The Battle of the Five Spot,” the owners, the Termini brothers, ended up extending it by four months. The controversy over Coleman’s music had created such a stir that listeners were lined up at the door to find out what it was all about, and the Terminis knew they were onto something. A generation earlier, Louis Armstrong and his jazz contemporaries railed against the bebop being played by the younger musicians of the time, Armstrong calling it “Chinese music.” But as time went by, Armstrong made peace with the new music, as did others. Similarly, more than 50 years after Ornette Coleman showed up in New York, the jazz world has by and large come to terms with his atonal, unstructured music and, yes, has even absorbed its influence.